It seems we do a lot of re-gardening. I just can't seem to leave well enough alone. What fun would that be? So after a garden area has settled in for a year or so it's time to make changes even before addressing other areas that have yet to be finished for the first time. The circle garden was fully planted in 2012 and looked great for fall that same year. We don't get much freezing rain here in San Antonio, but today it brought an unusual opportunity for frosty spiky plant photos. 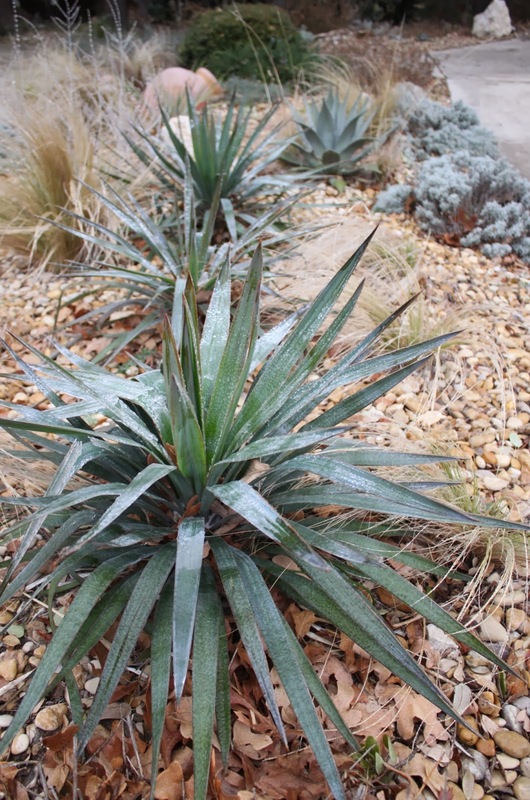 The Yuccas are taking this cold winter weather in stride. On the fourth Wednesday of each month I join Gail at Clay and Limestone and other bloggers for Wildflower Wednesday to celebrate flowering native plants in my garden. January's choice is Apios americana. 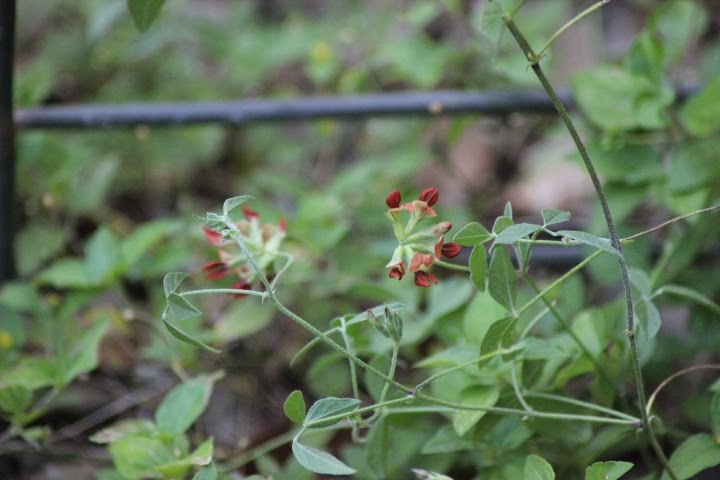 When I first noticed this little plant flowering near my fence in the back yard I thought it was an especially pretty native plant so I identified it as Apios americana commonly known as Groundnut or Wild potato. With freezes pushing into south Texas as early as November and Monday's well-publicized deep freeze I know some of you are wondering about the Bismarck Palms in the front yard. There is other news to report on the state of the garden but I'm pretty sure you'll want me to just cut to the chase here. During December I posted our holiday visit to the Phipps Conservatory in Pittsburgh. It's a beautiful building full of fascinating plants and I promised to continue the tour with more on the conservatory and a look at some of the areas which were not decorated for the holidays. 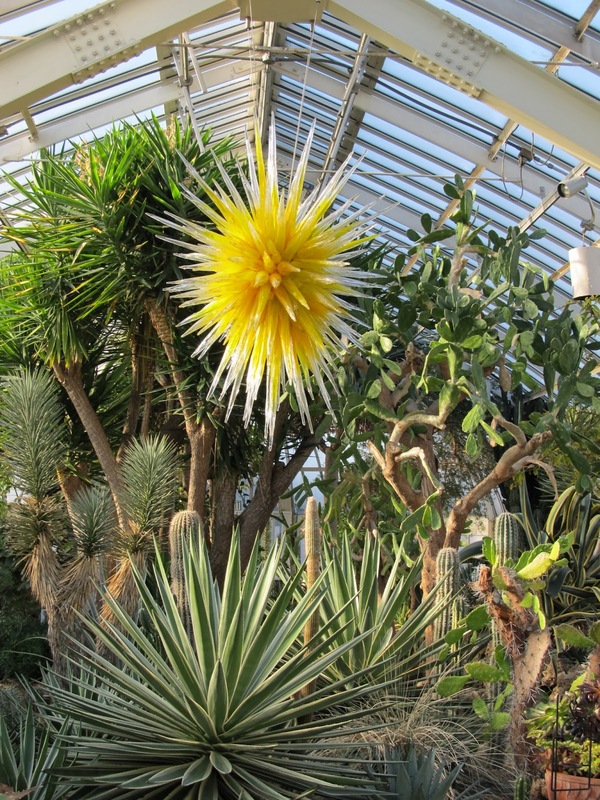 We'll continue our tour in the Desert Room with a look at the Chihuly art glass piece hanging in the entry. I do a lot of re-gardening by working and reworking spots that have already been planted. There's an area near the front walk that has been a gardening challenge. 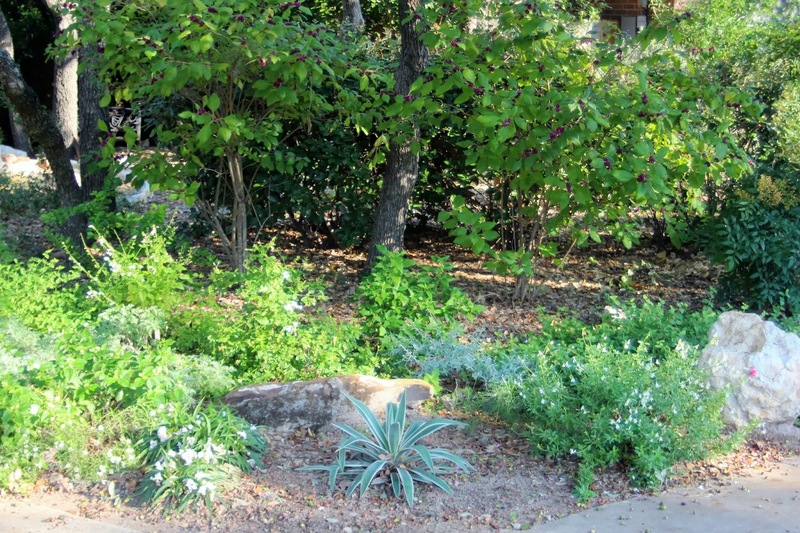 At first I thought it should be a perennial bed and planted it with white blooming plants and silvery Artemesia. 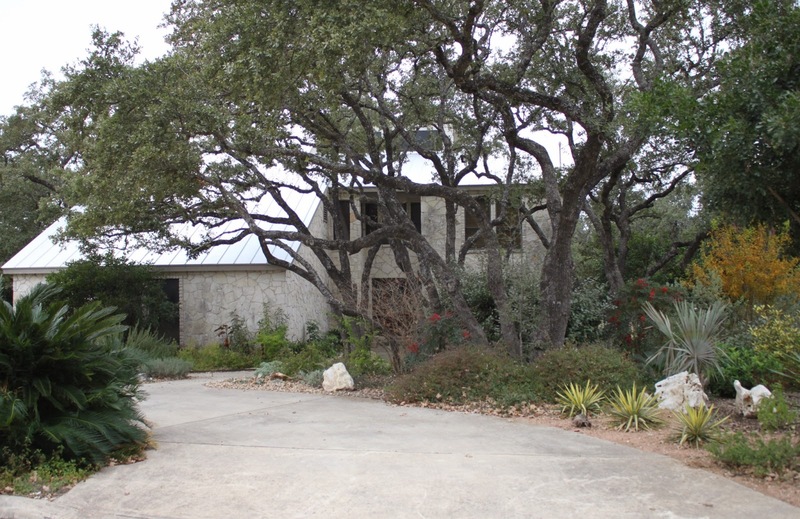 The blooms were sporadic and some plants didn't bloom at all as the trees grew out, shading more of the bed in summer. The deer often ate the dwarf Ruellia down to the ground and the whole thing ended up looking jumbled as the plants bloomed at different times. This was the one day in three years it looked good just before the deer decimated it once again. Where did all these plants come from and how many did I actually acquire during the past year? I pondered those questions a year ago around the time I posted about my first plant purchase of 2013. Since 2012 was a pretty big year for plant purchases I came up short in the tracking department so I kept track in 2013. The results surprised even me. Throughout the past year as each plant arrived I took a photo and noted the date. They came to me in almost every way possible from swaps to mail order to local nurseries and even some were left on the front porch. The stories of these plants follow my blog pretty closely so my 2013 plant acquisitions are my 2013 Year in Review post. 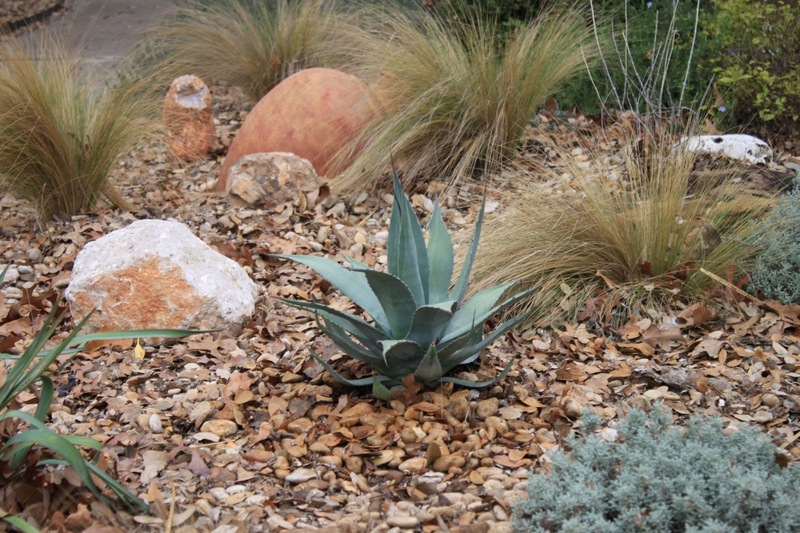 The first plant of the year was the Agave neomexicana planted in the driveway island. The part I didn't write about at the time is where I purchased this plant. One of my favorite places to buy plants is the Military Exchange or PX. All major military bases have an Exchange or PX and many also have a garden center. 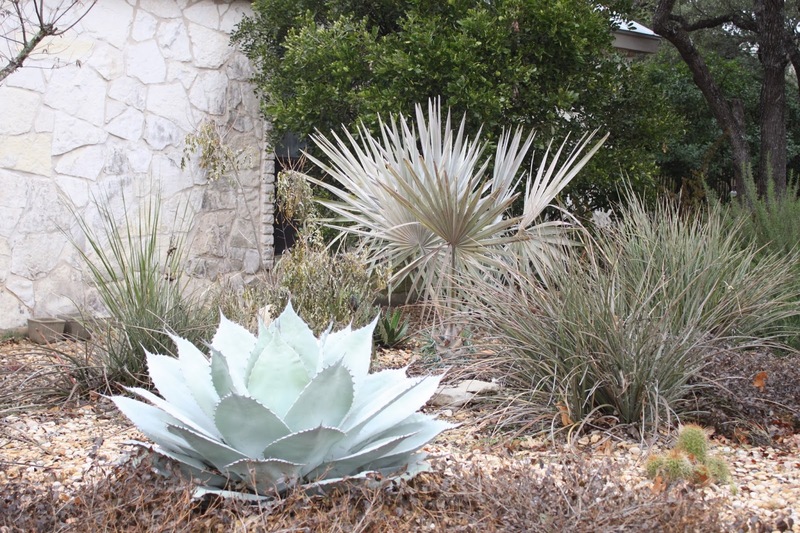 The plant selection is very good in the San Antonio area. Regular readers will recall the Bismarckia nobilia or Bismarck Palms which were a hit on the blog in 2012 and were purchased at the PX on Ft. Sam Houston. Several plants I've added this year were also purchased at the PX including this agave so I will point them out as we go along. The first post of 2014 is a wide shot of the garden for the meme sponsored by Heather at Xericstyle on the first of each month. It's been cold and colder this year and I can't remember so many gray days in a row. Eventually we will see the sun again and wish for a few clouds to break the monotony. Plan your garden for winter is the advice of many garden books and I definitely considered winter when planning the front garden with choices of evergreen, ever-silver, and ever-gold plants. The basic plants don't change much at all through the year. This angle shows the gold leaves of Pomegranate 'Wonderful' and the red berries on the Nandina add color to the garden when blooms are scarce.